We want to be your “Pit-Stop” in Santander. You will be pleasantly surprised by Our Philosophy, Location and Facilities, and this is a promise!!! 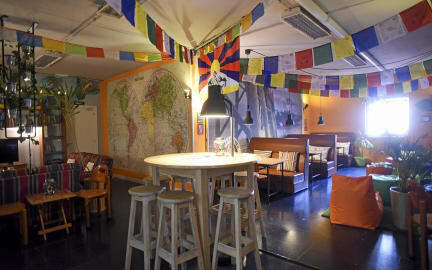 Because we understand your needs and, with only two and a half years since its opening, Santander Central Hostel is the only independent hostel in Santander designed & managed by backpackers (All globetrotters, groups and pilgrims) for backpackers. And that makes a huge difference!!! 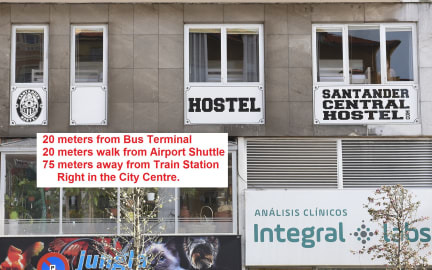 Our location is so convenience for your visit to Santander, that we are a few steps away from the Main Bus Terminal (25 meters), Main Train Stations (50 meters) and Airport Shuttle (30 meters). We have an amazing location which will allows you to find endless options to enjoy our lovely city. You won't need to take any public transport or taxis to move around. We are right in the heart of the City Centre…. Where things happen!!! Our cozy Common Rooms is designed to make you travel with your imagination to the most remote places in the world. The shared kitchen is fully equipped to make the most culinary challenges… and (of course) to help you to save some money by cooking here. Our buffet breakfast and made to order fresh coffee is optional (€3), and it will help you to charge your soul with full energy while listening to amazing music. We guarantee the most amazing start-up of the day. All our dormitories include bunk beds. They are paneled for a greater privacy. Also, beds are built on high quality wood and they have (2) USB ports, electric plug and a reading light. Our mattresses are protected with hygienic covers, and clean comfy sheets are provided as well. You have your own locked individual locker with own key to store your personal items. We want to be the best hostel in Santander, and we promise to you that we will work for it every day of your stay with us. Cancellation policy: 7 days before arrival. No -Shows full reservation. Payment upon arrival by cash, credit cards, debit cards. This property may pre-authorize your card before arrival. Note that non full E.U member´s. credit cards (UK credit cards included) have a 1€ extra charge per night, due to high bank exchange commission rate. Reception starts at 13:00 to 23:00. New arrivals are only allowed until 23:30 hrs. After this hour there is no reception not any way of lleting you in. Please make a note. O hostel é muito bom, fica literalmente do lado da estação de trem e da estação de ônibus e de um mercado, no centro da cidade e mesmo assim é bem silencioso. A área comum tem uma das melhores decorações e espaço para conversar/cozinhar dos hosteis que eu já fiquei. O atendimento foi muito bom e o local é bem limpo. Recomendo bastante esse hostel. I had a great time there. The location was perfect for me and the staff was marvellous. Very kind and friendly, one of the best places I had been. The room with 16 beds has only one tiny window, that is usually closed, because of that the room gets really hot during the night. Also, the bathroom don't have a area for us to dry and put some clothes after the shower. Location is perfect.